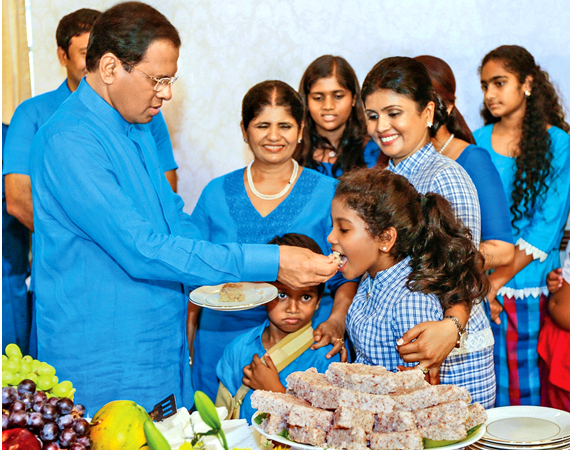 President Maithripala Sirisena celebrating the New Year with the family. Picture by Sudath Silva. In keeping with traditions, President Maithripala Sirisena performed the New Year rituals at his official residence in Colombo, on April 14. He planted a Beli sapling at his official residence at the auspicious time. Thereafter, he engaged in the tradition of transactions for the New Year. Several including Parliamentarians and artistes visited the President’s residence to greet him on New Year’s day.